The national flag and civil ensign is shown on Flaggenbuch [neu92] as an horizontal triband green-white-red with proportion 1:3. The proportion of the 1951 National Geographic [geo51] illustration is slightly less than 1:3 (about 4:11) but Pedersen [ped71] says that the 1:3 ratio and brighter shades were fixed in 1933. According to Smith [smi75c], the basic tricolor dates from the Constitution of 14 August 1905, with artistic alterations in 1912, 1933, and ca. 1964. The national flag, the war ensign and the service flag are shown by Smith in 1975 with proportion 4:7. From the chronology, this change most probably occurred ca. 1964. National flag with golden lion and sun in the middle. National flag with golden emblem in the middle - lion and sun within wreath and topped with crown. The best-known symbol of Iran in recent centuries, however, has been the lion and sun motif, which is probably a graphic expression of the astrological configuration of the sun in the sign of Leo, although both celestial and animal figures independently have a long history in Iranian heraldry. The lion and sun emblem is very ancient, and Ferdowsi our epic poet writes that it was used by Rostam, the legendary national hero. Late in the nineteenth century an earlier scimitar motif was combined with the lion and sun and superimposed on a tricolour of green, white and red, and, with minor modifications, this remained the official flag until the revolution of1979. The green stripe is said to represent growth and prosperity, and is the colour associated with the Prophet's family, the white peace, and the red the willingness of every Iranian to shed his blood for his country. The "Marine Impériale: Album des Drapeaux et des Enseignes" lists this flag as the "war flag", and whilst (in one sense) this term is interchangeable with "naval ensign" in this instance the Album says that it is also for use by the military over fortresses etc (so it is a "war flag" rather than simply a "naval ensign"). Green square flag with the same emblem as on the naval ensign. Trapezoidal tricolour pennant (width at fly:1/3 hoist) with the same emblem as on the naval ensign. Minimal ratio was 1:5, but a longer pennant was used for larger ships. In the photo, near the right shoulder of the Persian emperor, c, April 1926, appears to be the royal flag. It is very impressive looking. 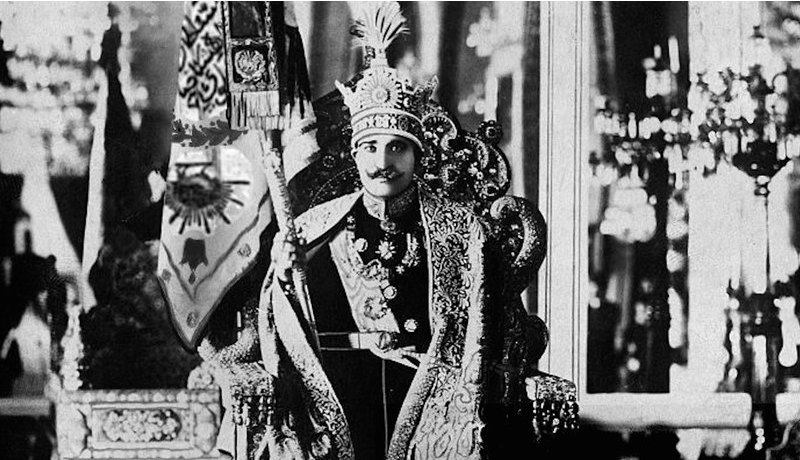 Reza Shah Pahlavi, the founder of the Pahlavi dynasty, is seen at his coronation in Tehran, Iran, April 25, 1926.